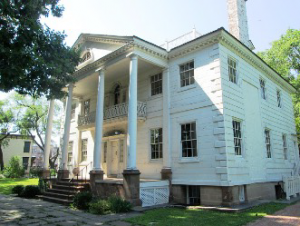 Alexander Hamilton's Home & Washington's Headquarters | Custom & Private New York Tours, Inc. The Grange, Hamilton’s home is located in Harlem (aka Hamilton Heights) at its third location. Visiting this historic home is a step back in time, filled with fascinating exhibits. Hamilton passed away from the wound inflicted by Aaron Burr during their 1804 dual on the day after their fateful encounter. The Morris Jumel mansion (included photo), the oldest home in Manhattan (1765) served as General Washington’s base of operations after the disastrous Battle of Brooklyn. Visit his map or “war room” and enter the bedroom of Mr. Burr who passed away there the day after his divorce from Eliza Jumel. The home is due to undergo restoration and provides a wonderful experience to walk where our founding fathers walked, planned and dined.